Shuswap Association for Community Living creates opportunities and provides support to optimize the potential of individuals with diverse abilities in our community. SACL Employment Service supports local employers who hire individuals with diverse abilities through job coaching and ongoing supports to ensure success. Support Services for daily living is provided to an individual or groups to promote rich lives and community inclusion through residential living, employment and skill development. Supported Living assistance is available for support with daily life skills and activities for Persons Supported who live independently in the community. SACL assists families of persons with diverse abilities to obtain the support staff and services required through the CLBC Individualized Funding Program. 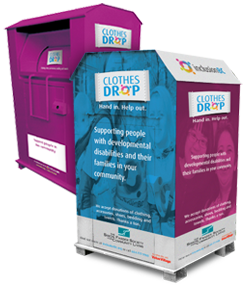 Due to a tragic incident in the Lower Mainland, our clothing bins have been removed from the community until they can be fitted with additional safety equipment. We apologize for any inconvenience this may cause, and we hope to have the bins redistributed in the community before Spring of 2019. Please continue to donate to local people with diverse abilities, by placing your donations in our indoor clothing bin, located on the 3rd floor of the Andover Place building at 371 – Hudson Avenue NE. Find out more. Support Services for daily living is provided to an individual or groups to promote rich lives and community inclusion through residential living, employment, and skill development. In Home Sharing, the person receiving support and the Home Share provider or family live as equal participants in the home, sharing a close relationship that supports inclusion, growth, and opportunity for all. Employment Services assists local businesses by identifying Persons Supported with the specific skills, traits, and abilities required for your position. In-house and outreach services designed to support and include individuals with diverse abilities safely into the community. Accreditation assists Service Providers to improve the quality of their services and meet internationally recognized standards of excellence. 5 New Clothing Donation Bins being placed the week of May 28, 2018. New bins placed in Chase, Canoe, Grinrod, Balmoral and Salmon Arm. Click here for locations. Please click here to review the HWLS closure dates for 2018. The Shuswap Association for Community Living depends on the generosity of our community. We’re proud to offer safe and securely online donation processing, or if you prefer you can mail your donation to to us directly. You can make a difference, your support will make a difference. Please visit one of our Donation Boxes near you! © Copyright - Shuswap ACL. Website by iDreamDigital.